What a special occasion we had on Monday as the Lunchtime Football Leagues came to an exciting conclusion. The Girls League was won by Dublin, while Galway triumphed in the Boys League. The standard of football throughout was excellent with some fine displays of skill and Scoil Oilibhéir determination. We sincerely hope that some of the children continue to improve their skills by playing football with their club, or perhaps joining a club. 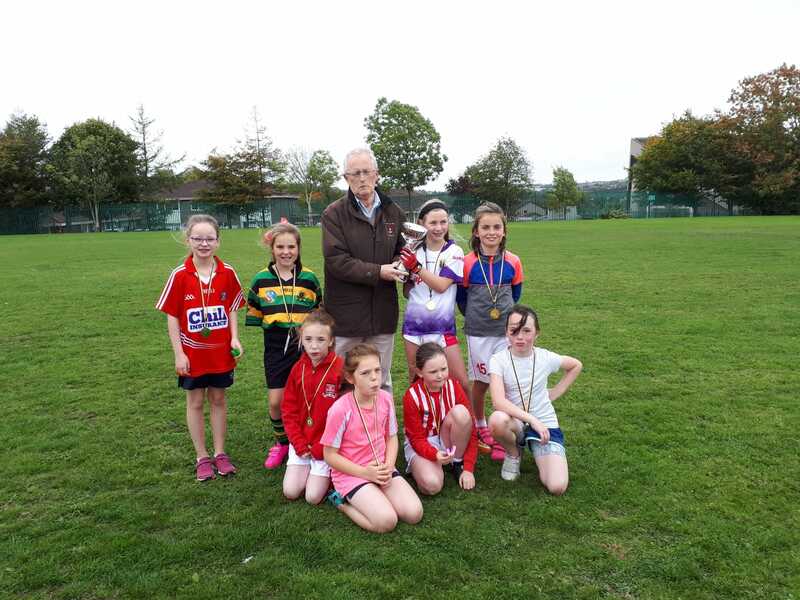 We had a very special visitor to present the medals and trophies to the winners – former teacher in Scoil Oilibhéir, Mr Jerry Walsh. Mr Walsh was the teacher who first introduced Gaelic Games to the school, and our teachers today continue this dedication to our national games. Sincere thanks to all of the children from 3rd and 4th for taking part, and to all their teachers for their cooperation. Thanks also to the many teachers who gave up their lunchtime so that the children could pit their skills against each other. Finally, special thanks to Mr Barry, Mr Elliffe and Mr O Driscoll for organising the Leagues. Ollies Abú!